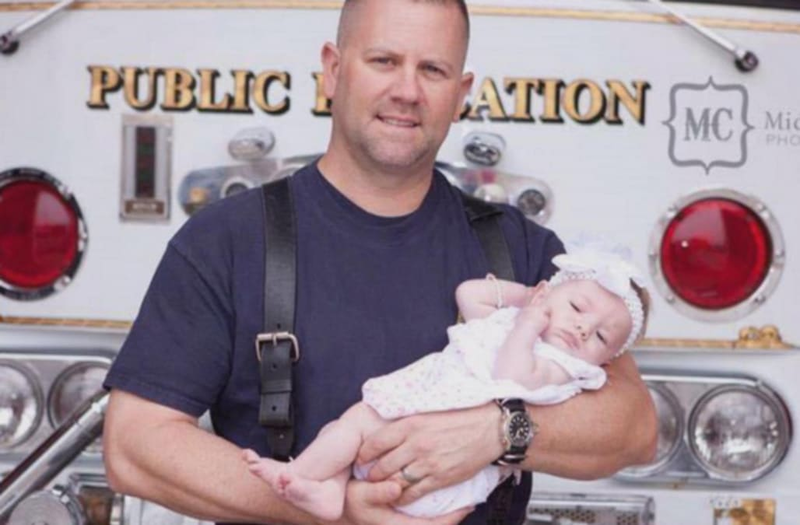 This South Carolina firefighter will never forget the day he met his adopted daughter, as he was the one who delivered her in an ambulance while he was on the job. "We have this bond that I think supersedes even other father-daughter relationships," said father-of-three Marc Hadden of the Myrtle Beach Fire Department. Hadden told InsideEdition.com he was responding to a 911 call about a woman suffering from abdominal pains. He and his partner quickly realized she was actually showing symptoms of going into labor. "You can talk about how cool it would be to deliver a baby, until it actually happens," Hadden said. "We weren't ready. We get monthly training but we had none of that going on for us." After the mom gave birth, Hadden said he looked after the newborn as his partner looked after her mom, but they quickly realized the baby girl wasn't breathing properly, and rushed the pair to the hospital. "When I heard the doctors telling the nurse she's being put up for adoption, immediately, I said, jokingly, 'I'd like to throw my name in the hat,'" Hadden said. "Never did I think that it would become a reality less than 48 hours later." He explained he and his wife already had two sons at the time, but dreamt of having more kids. "My wife was basically told to wrap it up, that any further pregnancies could cause complications for her and for the potential baby," Hadden said. "We had in our hearts that we wanted to adopt, but checking into it, we learned very quickly on a police officer, firefighter and teacher salary, we were not going to be able to afford it." But, he and his wife were granted custody of the newborn baby girl they named Gracie, and were bringing her home two days later. Despite the unexpected addition to their home, Hadden said the entire community pitched in, and gifted them diapers, baby bottles and other goods they would need to raise their little girl. Gracie, who is now 5 years old, has seamlessly become daddy's little girl, and has become the little sister her two brothers, 12 and 14, are tirelessly protective of. "I love my boys more than life itself, but Gracie has me wrapped around her finger, there's no doubt about it," the father joked. Even though Hadden, who has retired from firefighting, said his daughter might still be too young to understand it, they have since brought her back to the exact ambulance she was born in. "We're tight as thieves, for sure," he said.